As the story goes CFIB founder John Bulloch was sitting in his tub reading a federal government white paper on tax reform in 1969. When he saw the government planned to “realign” the economy by raising taxes on small businesses in Canada, he took action. He exposed the scheme in the Toronto Telegram and the ensuing protest was the closest thing Canada had seen to the villagers storming the castle with torches and pitchforks. Thousands of independent business operators came together to protest the idea and out of this movement, CFIB was created. Since that time, CFIB has argued for a lower small business tax rate to recognize, among other things, the disadvantage small firms face when trying to access credit and raise capital to reinvest in their businesses. When it comes to tax policy, the Small Business Tax Rate (SBTR) is our DNA. That being said, as governments prepare their spring budgets, the recommendations are now beginning to flow from vested interests to guide the decisions being made by Ministers of Finance and their departments. Right on cue, the Atlantic Provinces Economic Council (APEC) has released its Atlantic Report titled Exploring Opportunities for Tax Reform, providing fiscal policy recommendation for each of the four Atlantic Provinces. Three key recommendations were put forward for Nova Scotia. Interestingly, the first two have been long standing positions articulated by CFIB in its pre-budget submissions over the past decade. The first recommendation is to “focus on expenditure restraint in balancing its budget beginning and laying the groundwork for growth-oriented tax reform”. CFIB members would agree wholeheartedly. Government must begin its budgeting exercise not by searching for new and exciting ways to tax us, but to apply a very sharp pencil on the spending side of the ledger. It should also be noted bracket creep was highlighted in Laurel Broten’s Nova Scotia Tax and Regulatory Review ‘Charting a Path for Growth,’ released in 2014. Her recommendation is a built-in cost-of-living adjustment for personal income taxes. It’s a sensible approach CFIB put forward when we met with Ms. Broten during her stakeholder consultations. So far, so good. However, it’s the third recommendation from APEC where we part ways. It should also be very alarming to all small business owners. APEC recommends more than doubling the provincial Small Business Tax Rate, beginning January 2017, from 3% to 7% and a reduction of its general corporate tax rate from 16% to 12% by 2021. This recommendation echoes Ms. Broten’s original notion the taxes on larger corporations in Nova Scotia should be reduced and the reduction should be paid for by smaller business. Nova Scotia currently has a competitive SBTR, but it continues to have the lowest small business tax threshold, the amount below which a business is eligible for the rate, at $350,000. Every other province in the country has a $500,000 threshold. This already puts small business in Nova Scotia at a competitive disadvantage with the rest of the country, raising the SBTR would only add insult to injury. At risk of attributing motivation to these recommendations, it should be noted that APEC board is comprised of representatives of some of the biggest corporate entities in Atlantic Canada, so it’s not hard to see where this is coming from. To be fair, CFIB agrees with APEC the general corporate tax rate should indeed be lowered. It will create a more competitive environment to attract larger firms and offers greater opportunity for job creation and investment. That’s fine, just don’t make small businesses pay for it. It’s hard to imagine the Premier would be prepared to head out on the election trail in 2017 selling the idea to small business operators that the reason they’re paying higher taxes is so the province could provide a break for Irving, Fortis, Emera and Sobeys. Really? If the past two budgets are any indication, this government doesn’t seem to have much appetite for going to war with small business over the SBTR. Both of the previous Finance Minister’s budgets wisely ignored Ms. Broten’s suggestion and there are few indications Premier McNeil, a former small business operator, would embrace the suggestion from APEC. In fact, CFIB has been very supportive this government’s efforts to help small business by laying the groundwork to reduce regulatory burden in Nova Scotia. However, any move to add additional financial burden on small business through an increase in the SBTR is, from CFIB’s perspective, a non-starter. 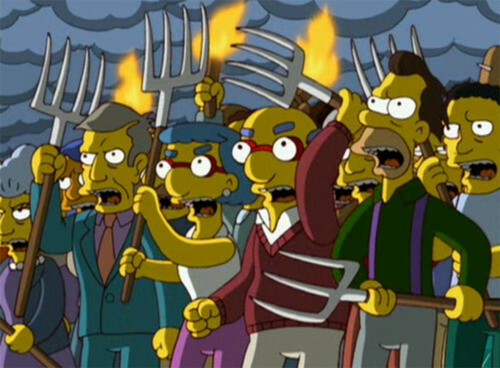 Should the government actually decide to heed the advice of large corporate interests and raise taxes on small business to pay for a break for larger corporations, it won’t be just the film industry circling province house, every small business owner in the province will have reason to pick up the torches and pitchforks.